The most popular e-reader on the market is the Kindle from Amazon. That being said, the Kindle is not the only e-reader available. In fact, Barnes & Noble announced that it has redesigned its Nook to hopefully raise awareness about its product. This new redesign is called the Nook GlowLight. The Nook GlowLight is a lightweight e-reader that uses E-Ink technology much like the Kindle. In fact, the technology that is in it is just like the Kindle Paperwhite e-reader. The Nook GlowLight e-reader has an easy-to-read, 6-inch screen. It has up to 62 percent more pixels on the screen than the Nook Simple Touch and even has improved text clarity thanks to better contrast. According to Barnes & Noble, this new e-reader has an improved LED-based light source. This makes it possible to read your favorite books even in the dark. This new LED technology helps light to cover the screen more evenly. 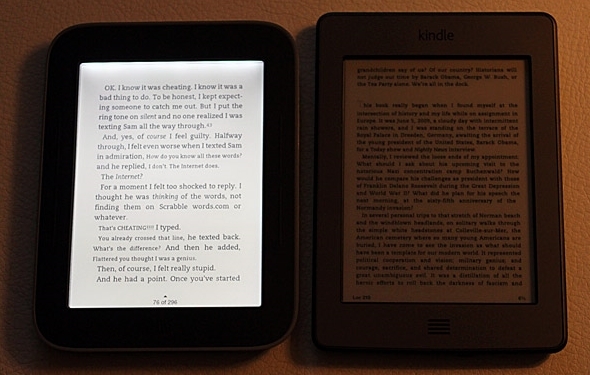 Although this e-reader looks much like its predecessor, the biggest difference is the weight. The GlowLight is just 6.2 ounces. This makes it even lighter in weight than the Amazon Paperwhite. After holding this e-reader for an extended period of time, it is easy to notice the difference in weight. Barnes & Noble said that it has also worked on reducing the effect of ghosting when the page turns. This is called “page-turn flash zero.” This new model comes with 4 GB of space, which should be enough room to store up to 2,000 books. This means that the GlowLight comes with double the amount of space that the Paperwhite has to offer. It will set you back about $120.